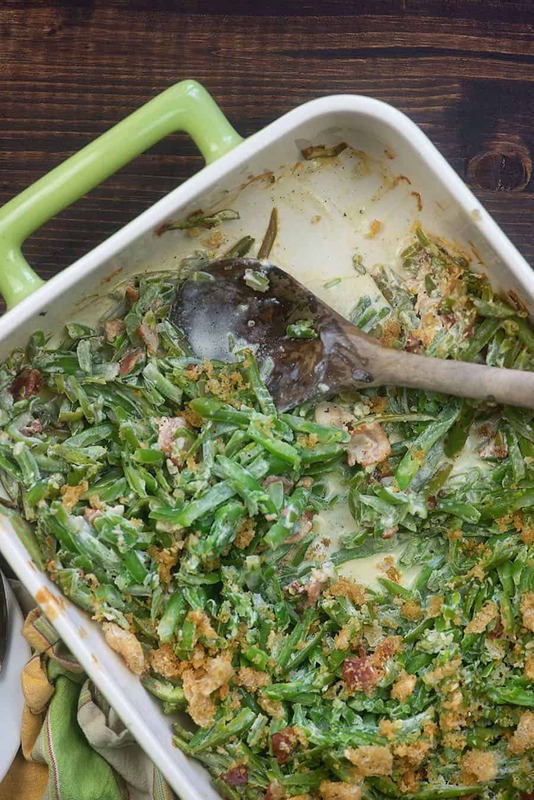 I grew up side-eyeing the green bean casserole. 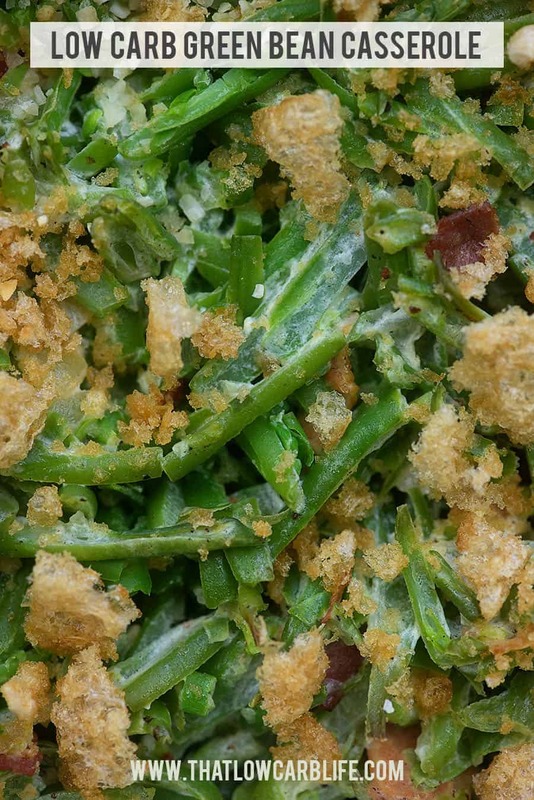 Let’s be real – it’s not the prettiest dish and also, as a kid, green beans were the devil. Luckily, my kiddos did not inherit the hatred of green beans that I had as a kid. They LOVE them and now I do too. Normally I just cook green beans in bacon grease with tomatoes and onions (do you want that recipe? It will always be my favorite way to eat green beans! 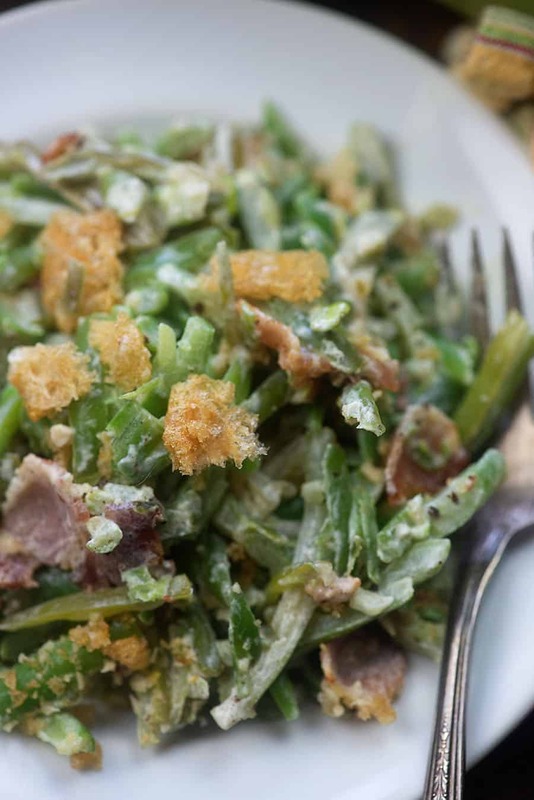 ), but as the holiday season approaches, I knew I had to dream up a low carb green bean casserole. Rather than your traditional can of cream of mushroom soup in this recipe, we’re using cream cheese as the thick, creamy goodness. 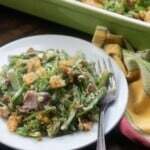 It coats the green beans and adds great flavor. To start, we’re going to fry up some bacon. I feel like all delicious recipes start with this step, don’t you? Add in some diced onions and a bit of garlic and cook until the bacon is crisp and the onions are soft. You’ll want to leave about a tablespoon or so of bacon grease in the skillet, but drain off any excess. Add a brick of cream cheese and some chicken broth and cook that over low heat, stirring constantly, until the sauce is smooth and creamy. Pour that mixture over a bowl full of frozen french cut green beans and give it a good stir. Pop the mixture into a 9×13 baking dish. Everyone loves the crunchy goodness of the fried onions that traditionally top a green bean casserole, but they’re full of carbs so we’re getting creative while still keeping things simple. Crush up some pork rinds and sprinkle those over the top along with a little dried minced onion. Flavor + crunch! Doesn’t get better than that! This low carb side dish was a big hit with my family. I hope you’ll test it out on your family this holiday season too! Keto Deviled Eggs: These make a great snack, appetizer, or side dish to any holiday meal. Cauliflower Casserole: A true favorite of mine, so rich and creamy! Prosciutto Wrapped Asparagus: Elegant and so full of goodness – this one is perfect for holiday dinners. Broccoli Casserole: Have you seen the reviews on this recipe? People rave about it! For more low carb goodness, be sure to follow me on Instagram! 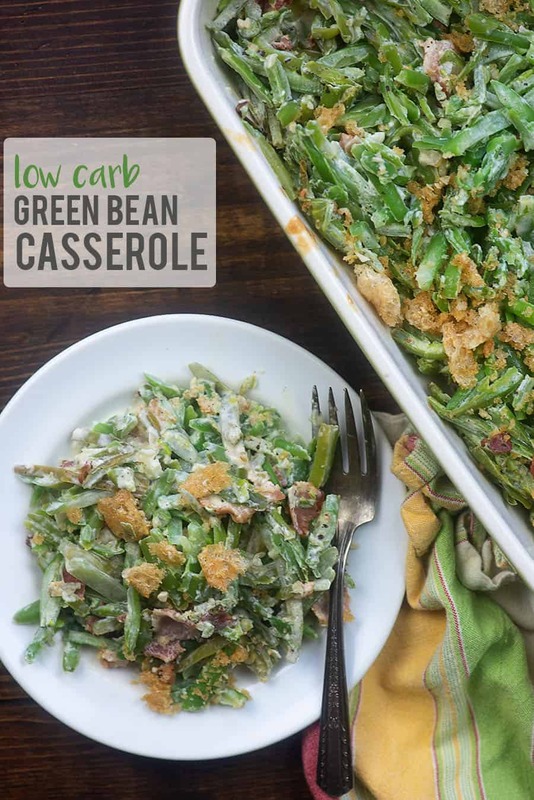 Low carb green bean casserole made from scratch! This is the perfect side for any holiday dinner! 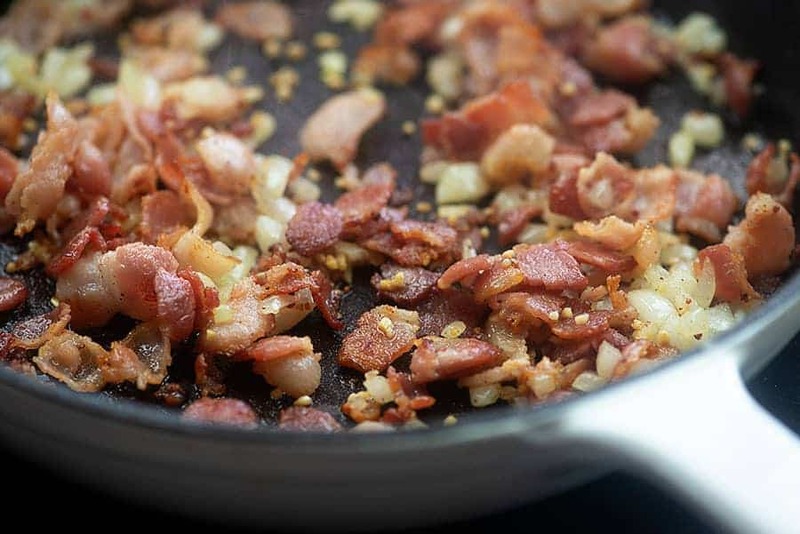 Add the bacon to a medium skillet over medium heat and cook, stirring frequently, until bacon is beginning to brown. Add the onion and garlic to the bacon and continue cooking and stirring until bacon is crisp and onion is soft. Drain all but 1 tablespoon of grease from the skillet. 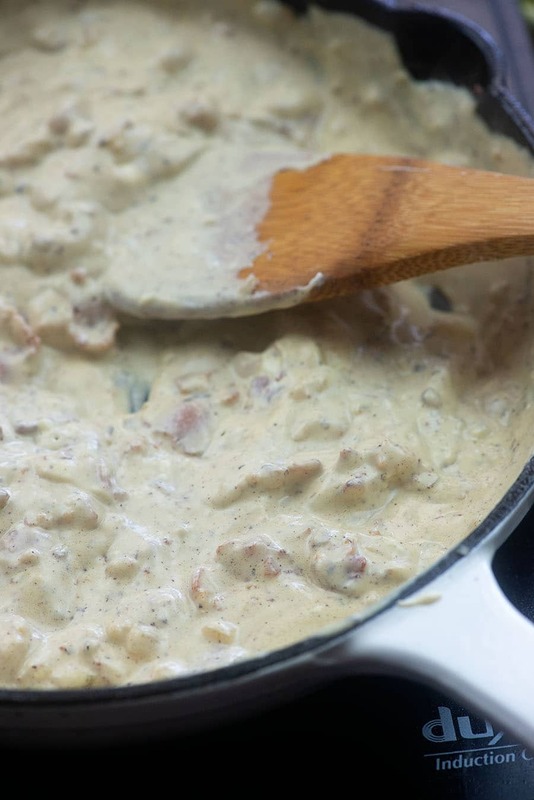 Add the cream cheese and chicken broth to the skillet and cook over low heat, stirring constantly until the cream cheese has melted and the sauce is smooth and creamy. Add the green beans to a large mixing bowl and pour the cream cheese sauce over the top. Stir well to coat. 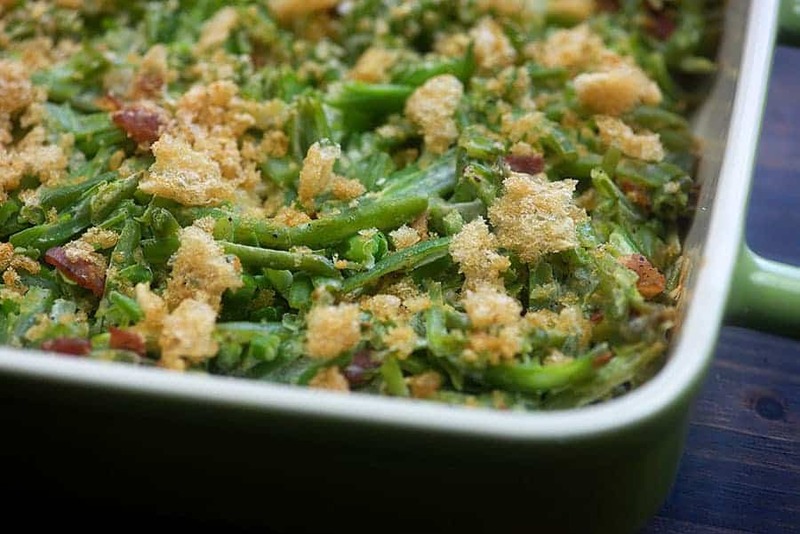 Add green beans to a 9x13 baking dish and sprinkle the top with the pork rinds and dried minced onion. I definitely have trouble getting in my greens throughout the day. This is the kind of recipe I need! OOOOOOO, yeah. Green bean orama! 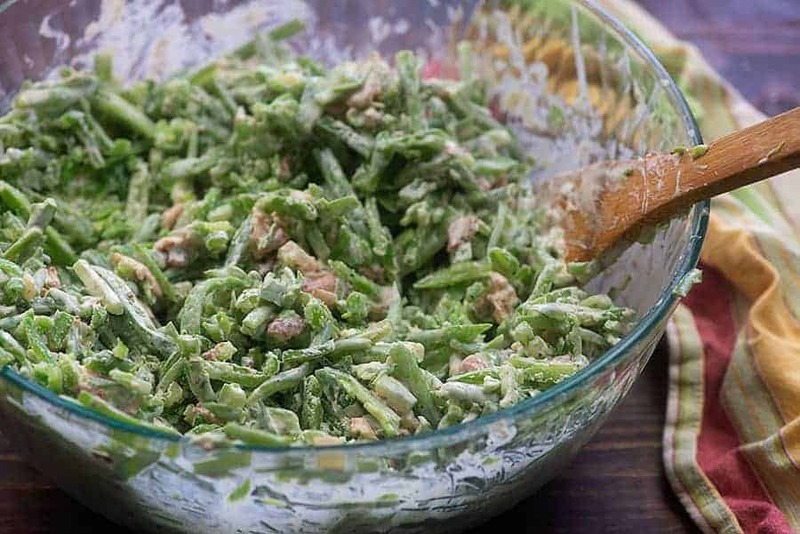 I open a can of green bean and dump them in my salad, then eat the heck out of them while I’m fixing the rest of dinner. I LOVE green bean. Pick them off the vine and eat them still warm from the sun. Cooked, raw delish! Thanks Karly, this one is a winner too. Do you thaw the frozen green beans first? Whats the serving size? 1/2 cup 1 cup? I calculated the nutrition based on this serving 8 people. I didn’t measure the serving size by volume. If I was to use fresh green beans with a pre-cook them or just mix it all together raw? I haven’t tried this with fresh green beans, so I can’t say. I have not made this particular recipe but I have made a different one with fresh beans, definitely precook the beans. I dehydrated some mushrooms and made a powder out of them. Think I will add a bit of the powder to this. Can you make this ahead and put in fridge for cooking latter in the day? I experimented with this last week in prep for Thanksgiving. I liked it better than the regular! I sauteed fresh mushrooms separately (since they produce so much water I was afraid of messing up the cream cheese sauce) and added it to the mix and it was DELICIOUS! I can’t wait to introduce this to my family this week! Thanks so much! Yay! Hope it’s a hit with the family too! I am making this two days ahead. Should I wait to add the pork rind until I’m ready to bake? Can I use can green beans and do I cook them first? Canned green beans should work fine. No need to cook them first.